Valentine’s Day is February 14th, and it will be here before you know it! This is an important floral delivery day to many women and here is your opportunity to score brownie points with your sweetie. Valentine’s Day flowers are an important part of this. The day it falls on each year is important. This year it is on a Monday and if you forget and try to order that same day, you take a chance on flower shops being sold out of her favorite flower, or not being able to get it there in time. And remember, the most important part of this is that her flowers get to her before any of her coworkers do. Yes it is a contest with the other ladies in the office. And our flowers are generally delivered in the order they are placed. May I suggest that you start the celebration off early. Surprise her on Thursday the 10th, or Friday the 11th and include a card message saying that you “Just couldn’t wait to say I love you.” Instead of wondering if you will remember, she will be surprised that you thought ahead. And I promise she’ll love the card. 90% of men sign the cards the same way, “Happy Valentine’s Day! Love, Your Name ” Then there is her co-workers, they will be ooohing and aaahhing, impressed at how thoughtful you are with your early floral delivery. While beautiful bouquets of red roses are the traditional gift, we have other colors or roses including yellow, purple, white, and many shades of pink. This is the perfect opportunity for you to show off a little if you know her favorite color. In addition to dozen rose bouquets, we have tulips, lilies, gerberas, and stargazes. Add a few balloons, a teddy bear, and chocolates and she’s sure to feel like a princess. There’s a big plus with early floral delivery Thursday or Friday – you’ll be able to choose morning or afternoon…..or specific hours if she works shifts or part-time. On Monday, we will deliver everything as promptly as possible, but we are unable to guarantee time deliveries…. and there’s the possibility that we will miss her if she leaves to run an errand. Your “Valentine” is the center of attention at the workplace, while others are still waiting and hoping. Hundreds of deliveries will be made from 8-5:30 on Feb 14th….by sending early, your Valentine will feel loved all day. AND REMEMBER…The unexpected generates more excitement and gets more brownie points! 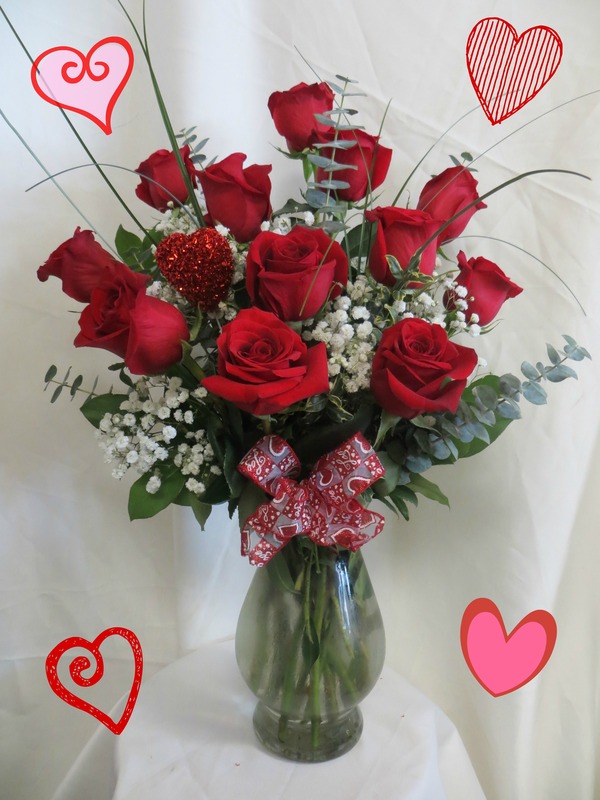 So check out our website and order you Valentine’s Day flowers now!